Proverbs says a soft answer turns away wrath. James 3 says that the tongue is a fire which can set a whole forest ablaze. 1 Corinthians 14 says to not forbid speaking in tongues, yet it also gives a long list of qualifications. With all these words about the tongue and tongues, how should we proceed? Our words have incredible power for building up or tearing down.This is true in general and it is also true with the spiritual gift of tongues. In Paul’s letter to the Corinthians he learns that this gift was making divisions worse, and so he gives some important words about that gift and about how we use our tongues. In Sunday’s sermon, I took the first step in trying to explain 1 Corinthians 14 and I spent my time focusing on the main point: build one another up in love by means of your spiritual gifts, especially prophecy. I defined what prophecy and tongues were, but I made most of the applications related to how we use our tongues. Next week we will finish up the chapter, and in two weeks, Lord willing, we will return to the whole chapter to answer questions about this confusing and often misapplied spiritual gift. Despite their obvious flaws, Paul loved the church at Corinth. And in his section on spiritual gifts in 1 Corinthians 12–14, he aims to help his spiritual children come to a true understanding of the Holy Spirit and the purpose of the spiritual gifts. Important for us standing twenty centuries removed is the way he begins with the Holy Spirit as the greatest gift in 12:1–3, followed by an understanding of the triune God in vv. 4–6. When questions about spiritual gifts come up, we must begin here: the greatest gift is the Holy Spirit himself. He is the one by whom we might know the triune God. Only after nailing down this truth can we move to understand the purpose and particulars of the spiritual gifts. Therefore, as I preached on this passage, this is where I focused—on the Gift and the Giver. We also considered the purpose or goal of the spiritual gifts and how these gifts functioned to promote the gospel in the early days of the church. First Corinthians 12:1–11 is a glorious passage but also intensely debated. As I prepared to preach this passage on Sunday, I found that it is more than the theology that is challenging in these verses; it is also the translation of the text. What follows are a few notes on what Paul is saying in these verses that help hone in on who he is speaking to and what God is doing. As we will consider this passage again next week, I will try to put up a few more translation notes as we consider this challening passage. There are a lot of cultural challenges to 1 Corinthians 11:2–16, a passage that invites discussion about the trinity, gender roles, the use of head coverings, and the role of angels in public worship. Tomorrow I will preach on this passage, but today I share a number of quotations from various commentaries related to various cultural and theological challenges in this passage. These quotes provide some background to this enigmatic passage. Likewise Isaiah 20 records how God commanded Isaiah to walk through Israel naked for three years to indicate God’s coming judgment on Egypt and on those who trusted in that foreign power. This outward expression of God’s will fits other examples too. For instance, the high priest wore garments of beauty and glory to reflect the presence of God’s holiness with Israel (Exodus 28:2); Nazirites did not cut their hair in order to express devotion to the Lord (Numbers 6); and many grieving saints tore their clothing or wore sackclothe and ash in order to express their contrition. So, throughout Scripture, clothing and hair did play a part in expressing worship to God. Moving from Old Testament to Greco-Roman culture, the same attention to dress is found. The church is more than a holding tank for Christians; it is a family portrait of God’s people. Created and sustained by the gospel, God’s local church, when it abides in the word of Christ, reflects God’s unity, holiness, and love. Yet, such Spirit-empowered characteristics do not come automatically. They must learned from Scripture and taught by the Spirit. This Sunday’s message attempted to capture these truths from an overview of 1 Corinthians 1–10. Last week we considered the relationship between the universal and local church, and how the latter is designed to frame the family of God in any one locale. This week we turned to the life of the church, which does not earn salvation but which does reflect the Savior when spiritual unity, holiness, and love are present. In 2016 our church has spent the year in 1 Corinthians, at least the first 10 chapters. As we turn our attention to the birth of Lord in just a couple weeks, we took time to review a few aspects of ecclesiology (the doctrine of the church) that we’ve seen in Paul’s letter. For now the debate about Trinity-gender analogies (1 Corinthians 11:3) and head coverings (11:6, 10) will have to wait. In what we considered yesterday, I made seven applications from 1 Corinthians 1–10 related to the universal and local church. Here they are in list form. You can listen or read the sermon notes; study questions and further resources are listed below. The church is both local and universal. The universal church is made of local churches. 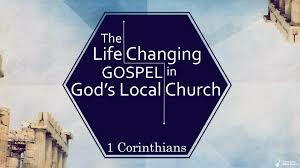 Individual Christians experience the universal church thru the local church. The local church calls the universal church to walk together as disciples of Christ. The local church (not the universal church) has been given leaders who know their sheep. The local church has power AND wisdom to exercise the keys of the kingdom. The local church provides visible boundaries for the universal church. “God is most glorified in us when we are most satisfied in him,” is John Piper’s famous dictum fusing God’s passion to be worshiped and man’s passion to be happy. Yet, spoken into our hyper-individualistic culture, this glorious truth might lead some to think glorifying God is an individual’s task. In truth, God is glorified as we use our freedom to serve others. We cannot glorify him if we care nothing for our neighbors or God’s creation. This is the point of 1 Corinthians 10 where Paul concludes his instruction about food sacrificed to idols by saying we are not to seek ourselves, but the good of others. God is glorified in eating and drinking that aims to strengthen others, not just ourselves. Likewise, if eating and drinking are shaped by the gospel, then it stands to reason (once again) that every area of life must be gospel-shaped.